"Jean Long Manteufel has a way of reaching deep into your soul with her meaningful, relevant and timeless articles. I especially enjoyed the letter opener article because it brought back wonderful memories of my childhood and watching my mother opening the mail each day with a special letter opener. Today I have that letter opener and think of my mother every time I use it. Thank you Jean for the memories." "A favorite read in our family - Jean's columns are always practical, to the point and written from her wealth of knowledge and life experiences. Jan and I will enjoy sharing this collection with our friends and family." 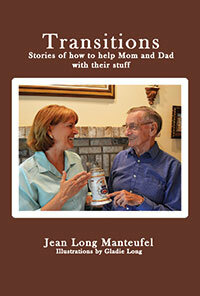 "Jean Long Manteufel has written a remarkable collection of essays about her work with older adults in transition. Jean's keen insight and engaging writing style makes this book a must-read for professionals working with older adults, seniors themselves, and their family members. Jean's book is positive, practical and chock-full of useful information!" "These stories offer great vision into the world of children facing real life challenges with aging parents. On a personal level, many of the stories hit the mark for what my brothers, sisters and I have been experiencing with our parents." Copyright © 2014-2019 Transitions with Jean | Virtualtech Website Design and Promotion, Inc.